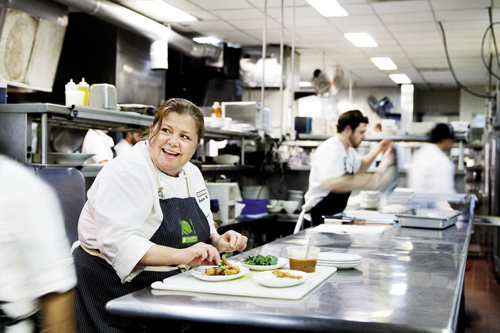 Michelle Weaver has been with the Grill since 1997 and became executive chef in 2010. The decor strikes a classic tone with wood-paneled walls, elegant drapery, and white tablecloths. 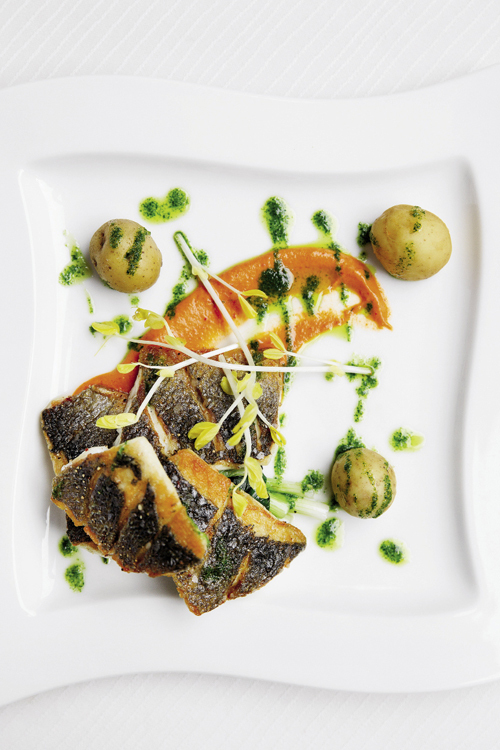 The “pure” section of the menu offers lighter fare, like this branzino with romesco and parsley-garlic puree. This stunning dish from the “lush” section of the menu pairs foie gras with apple pie and mascarpone. 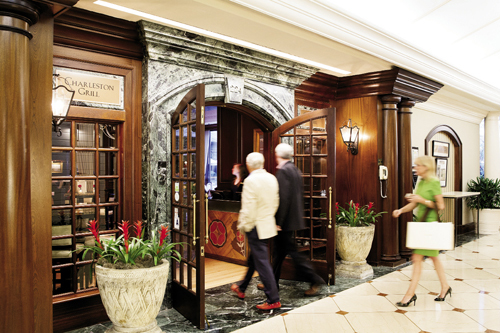 Guests enter through Belmond Charleston Place’s lobby. When visiting Charleston Grill, the Holy City’s long-standing zenith of fine dining, make a point to splurge on valet—it’s all part of the ritual. As you wend in from Meeting Street and carve across the brick drive that encircles the equine fountain marking the entrance of Belmond Charleston Place, the grandeur of the hotel sets an unmistakably luxurious tone. Uniformed attendants await beneath the porte-cochère. They are like sentinels of the doors that give way to the grand staircase, lobby, and concourse of posh boutiques within. If you’re here to dine, bypass the shops and sister bar The Thoroughbred Club, where longtime bartender Mouzon Taylor can usually be found shaking martinis, and make your way to Charleston Grill. Feign royalty as you ply your path. At the entrance stands longtime manager Mickey Bakst, who’s known for treating all guests like actual royalty, and for heading the most skilled service team in Charleston. (The restaurant was a James Beard Award semi-finalist in the Outstanding Service category this year.) Like colleagues executive chef Michelle Weaver and sommelier Rick Rubel, Bakst executes a level of personal service and attention to detail that others would do well to emulate. 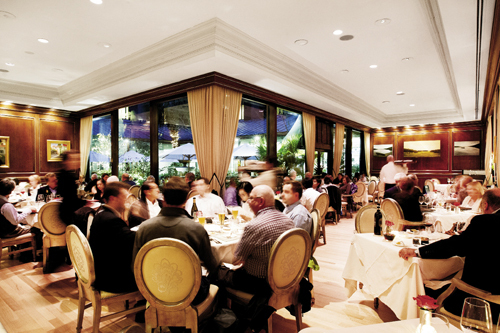 Send a business associate to the Grill, and they will come back raving about Bakst’s crew. Take your daughter for her birthday, and he may walk her across the gallery for a chocolate truffle at Godiva. An anniversary with your wife? Here, it’ll be the grandest of affairs. But she’ll get all the attention, from an opening kiss of the hand from Bakst to the parting glass of sauterne (just one of more than 1,000 selections from the superb wine list) Rubel drops off as a celebratory adieu. In a city where the food scene seems to be evolving at a dizzying pace, it’s nice to know that time hasn’t changed the old-school experience of this dining room. To that end, Weaver’s menu, which evolves with the seasons, is just as delectable as ever. Rather than following the focused themes so popular at contemporary establishments, she covers a variety of culinary styles, all well executed. After all, Charleston Grill serves one of the finest hotel and conference properties in Charleston, and its patrons represent a diverse range of visitors with an equally varied assortment of appetites. The menu’s four sections—“pure,” “lush,” “cosmopolitan,” and “Southern”—could almost describe the diners as well as the food. The live jazz that emanates from the cocktail lounge serenades business travelers looking for a light meal, found within the “pure” section of the menu. 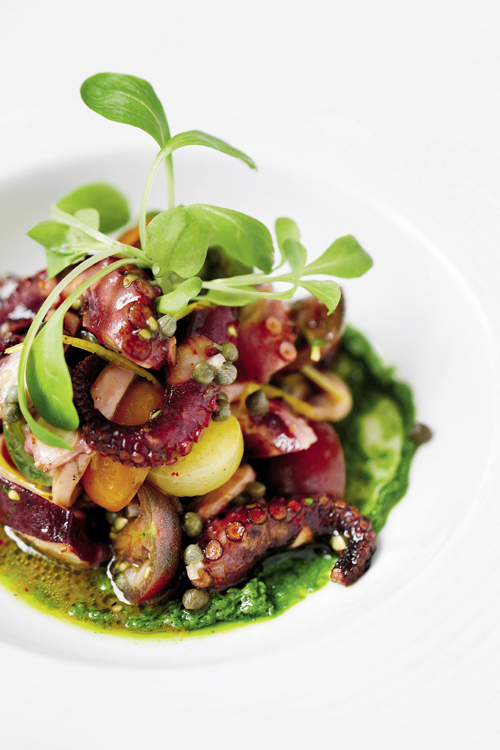 They tuck into sprite tendrils of tender octopus buttressed with heirloom tomatoes and capers, the dish’s bright acidity rounded by a base of fresh herb pesto. Or they opt for a simple delicata squash soup sweetened with apple and studded with spiced crème fraiche and kumquats plucked from trees in the hotel’s courtyard garden. Braised pork shanks await tables of tourists, fresh from historical tours and carriage rides in the Belmond’s white chariot. They look for something smacking of pork and smoke. Weaver delivers, plating a dish so prototypically Southern that it stands as a testament to the heritage and flavor that has come to define the genre over the last decade. A whole gargantuan pork shank braised in a concentrated jus quivers atop a stack of red field peas and collards melting into nuggets of smoked pork jowl. There is corn bread to sop the juice and a little sprig of rosemary, lest one forget that Weaver is a classical chef delivering the diners’ wish in its pure form. Moving on to the “cosmopolitan” column, the menu leaps across genre and culture, with references ranging from Iberia, which inspires a tapa of roasted piquillo peppers paired with blood sausage and Manchego cheese, to the Levant, where we find perfectly roasted beets napped with Lebanese yoghurt, za’tar, and pomegranates. The beets are tiny, local, exceedingly fresh, sweet without bitterness, and punctuated by the pop of pomegranates in every bite. Here, one can also find a beautiful expression of perfectly cooked handmade Italian pasta in a dish of bucatini and clams, even if the clams themselves get lost a bit in the interplay between a smoky dice of Benton’s ham and the bright squeeze of lemony acidity. The “lush” offerings include such opulent dishes as a $150 caviar tray and a $68 rack of American lamb. Better yet, opt for the best foie gras in the city, served sweet with apple pie, reduced sherry, and mascarpone cheese whipped into a soured cream, or a mustardy beef tartare that is equally unmatched. The selections change often, but Weaver typically stocks this part of the menu with classics done right. For a rich finish, the crème brûlée and assorted sorbets are worthy extravagances. “Extravagance” is an apt designation for Charleston Grill. For most, it’s a special-occasion spot. Without the prowess of Mr. Bakst, the concept might feel intimidating or stuffy. But even if it’s one of the most formal public dining rooms in town, everyone who walks through the door becomes a star, no matter their station. You’ll leave feeling sated, knowing that the next time you need a taste of the luxe life, you can find it right here, where it’s been all along. 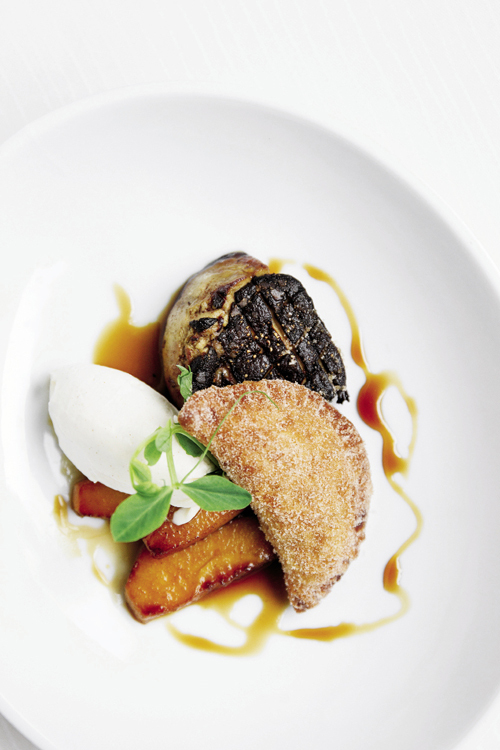 The Draw: In a city that worships fine dining, Charleston Grill sets the standard. The Drawback: For most, it’s a special-occasion spot.